BENT is a metal shelving unit. 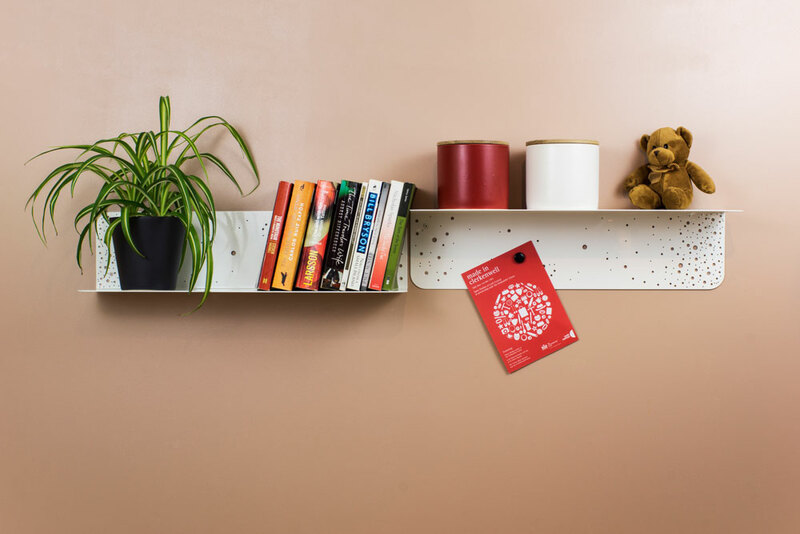 Its concept is beautifully simple; a rectangular metal sheet is folded to a 90 degree angle to create the shelf support, which is then screwed to the wall. This metal sheet is riddled with holes of varying sizes, which add a sense of lightness and texture, as well as creating interesting and enticing displays of light and shadow. BENT may be used as a solo piece to house objects and books; equally, it may be fitted in a group to create a vast and visually arresting wall mounted shelving display. BENT allows for even greater flexibility due to its potential to be fixed to the wall in two different configurations.